Each year, fishermen harvest more than $500 million worth of Atlantic sea scallops from the waters off the east coast of the United States. A new model created by scientists at the Woods Hole Oceanographic Institution (WHOI), however, predicts that those fisheries may potentially be in danger. 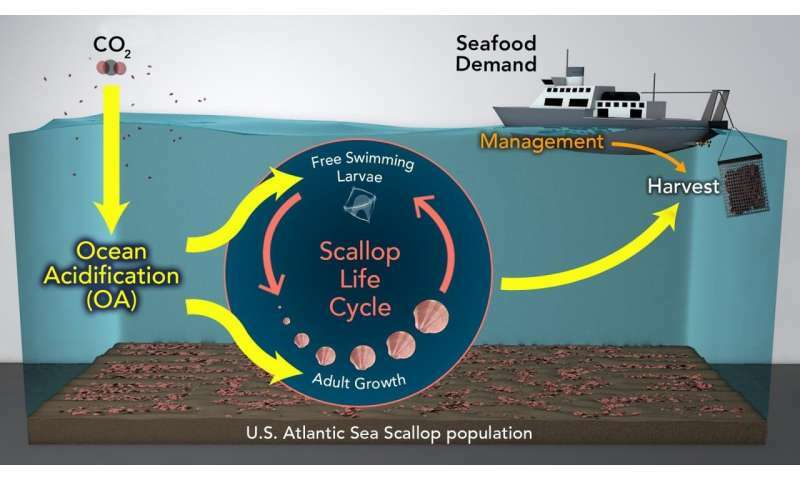 As levels of carbon dioxide increase in the Earth's atmosphere, the upper oceans become increasingly acidic—a condition that could reduce the sea scallop population by more than 50% in the next 30 to 80 years, under a worst-case scenario. Strong fisheries management and efforts to reduce CO2 emissions, however, might slow or even stop that trend. We are killing the base of the Marine Food Chain. WE??? Speak for yourself, gkam. I'm not going around with a basket and hammer - killing ocean life forms. I am also not polluting the oceans or the land.